Artwork details: pen, watercolour, 6 x 6 inches (15 x 15 cm), 1996. I think I probably used two types of pens here - one which was waterproof, and the other which ran with the watercolour when wetted. 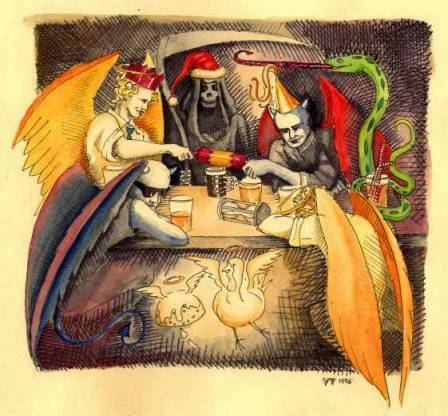 Cracker - demonic Christmas card for 1996. This is another image painted years before I did any more than the once-a-year Christmas card image, which, on account of the year-long lack of practice, was always a struggle. A supply of red wine was mandatory, and sulking over the results was optional. If you want my explanation of why devils, snakes and Death (the bony fellow with the scythe and cowl) are christmassy, you'll have to read the explanation I've put next to the 'Cerberus' image (click the thumbnail)... I shan't repeat myslf here, it would get boring.